When I decided to take a break from blogging, I had no idea how long I’d be “away”. I needed to revise my young-adult novel, and sometimes revisions are quick. Partly because, in addition to working on my novel and other writing projects, I was inspired to write a non-fiction book for moms. One thing led to another, and the next thing I knew, I had a 163 page manuscript that I’m now polishing. But life is funny that way sometimes—you plan on doing one thing, and another thing happens that sort of changes your plan. Which is kind of how my summer’s been so far. I’d planned on kicking it off swimming with the kids, seeing friends, and going on a few short trips. Instead, I’ve started it off in a wheelchair. In two separate, random falls (I still can’t believe it), I broke my arm and tore my knee. All in the course of one week. And all when my husband had to travel to India on business for ten days. My first set of crutches (that I ended up not being able to use because of my arm). And my first ride in one of those electric scooters at Target. I’ve learned how to blow dry my hair and put my makeup on with my left hand (I’m still having mascara issues). I’ve learned how to go up and down the stairs using one arm and one leg. I’ve learned how to type with my cast on. And—maybe the hardest part for me—I’ve learned how to accept help from others, because I’ve needed it. I know what I’ve been going through is small compared to what some people endure. I’ll be honest, though—as someone who usually runs around at full speed and is very independent—it’s been hard having life come to a sudden halt. But it’s been one of those blessings-in-disguise, too. I’ve had family and friends staying with me and helping, which has given us some great time together. And I’ve had more time with my kids, too. And even though I’ve had my share of melt-downs and tears, I’ve also had some good laughs. Mostly at myself. Like when I wiped a dot of mustard off my plate with a finger on my right hand, went to lick my finger, and realized I couldn’t get it to my mouth because of my cast. 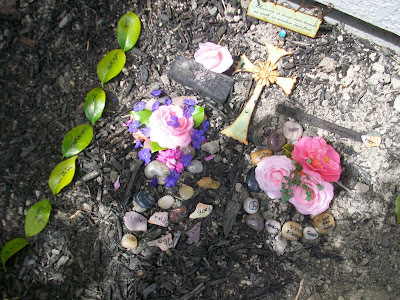 Spot and Blackberry—the mice that brought us so many adventures—died not too long ago, within a few days of each other. It was hard on the kids, but they felt better after the funeral, complete with music and eulogies and a lavish burial. I’ve also been fortunate enough to be able to write for some great sites, like PluggedinParents and MothersClick. And I was asked to participate on a conference call with Maria Shriver about her WeConnect campaign in California. She’s an inspiring woman with a true passion for what she does, and I was honored to write an online exclusive about her campaign. I put together my Web site too, which has some writing resources and links to check out if you’re interested. I guess I’m just glad to be back. I don’t know what my posting schedule will be yet. It depends on a lot of things, like if I end up having knee surgery or not. Goodness, when you come back you sure do so with a bang – an arm AND a leg? Yikes. I've done both, but never together. I'm glad you've got a good strong support system in place and are keeping your chin up.It's good to see you again my friend, I hope you stick around for a while :). We missed you and are glad to see you back. Hope you get healed up soon! Welcome back! You've had your hands full! Glad to have you back! I missed you! Glad you are back! Missed you! I can't believe all of the first's either. And here I thought only those things happen to me. Glad to know I'm not alone! Have a great day!!! oh yay, Genny…you're back!!! welcome!!! on the other had…oh, sad, Genny…you're injured! i'm so sorry for your recent falls. i hope you are better sooner than later. sounds like you are trying your best to see the silver lining in these tough times. i can't wait to hear more about your new books and check out your site!i'm glad you are back!!!! YAY!! You're back! I've thought about you, and wondered how your novel was coming along. :)AND what a rough week. :( I love how you just put a happy face on it, and look for everything humorous about the situation. Thanks for the example. I will now stop pouting about the little inconvenience I have to do tonight. THANKS!! I'm so very happy you're back! I hope you heal quickly. Can't wait to check out your website! Oh Genny!! You really like to make an entrance don't you?! :)I will pray that your recovery is a quick one. All of your writing and projects sound very exciting!Welcome back! Glad you're back! So sorry about your arm and knee. Praying for a super speedy recovery. wow, that is something- to break your arm and leg! Glad you still have your sense of humour intact though! You have had some exciting moments of your blogging break! Hope you heal quickly. Glad you're back but sorry your summer has been "off". It's amazing I haven't broken a bone yet considering how many times I ram my foot/feet into things. Take it easy!! Welcome back, Genny!! Wow, you have really had some "adventures!" You sound so positive about it all, but man, it had to be hard with your husband in India. Congrats on your book- can't wait to hear more! Genny,What a sweet surprise to see you comment on my blog! I am so glad you are back… your posts have been missed!Are you going to tell us more about the book you've written for moms? I'm sorry to hear about your fall and hope that healing takes place quickly! My gracious! When it rains it pours, doesnt it? It reminds me of our Christmas last year with two arm surgeries within 6 days of Christmas! Good for you for accepting help. Hope you heal quickly! Yes, and so goes my first visits to your blog. Stop by and share another cup when you have time to relax. Love your blog and your pic! So glad to see you back, but I'm so sorry to hear. I hope you are feeling better and moving around better these days. You have been quite busy and sounds like you have been doing some wonderful things! I can't wait to hear more. Oh my, you did start the summer out with a bang! I look forward to reading your blog often again. Welcome back! oh my gosh – I am so glad you are back I was starting to think you were gone for goodgreat post – so sorry you have had injuries – hope you heal soon! Ginny, thanks for your comment on my blog and I just wanted to come on over and visit briefly before I go on break and I pray healing over you and I'm so glad that you are back online.Blessings and peace dear sister. I'm so excited that you are back! I've missed you so much. I'm very impressed with your growth during your challenging times. I'm glad you have had a chance to get some special visiting time. Soooooo glad that you are back! And I can't believe you fell twice. Poor thing. I look forward to stopping by to catch up. Hang in there. Thanks, everyone! So good to "see" all of you!Stephanie, no, I don't have a publisher for my book yet. I'm currently submitting to agents. And as far as my kiddos…my daughter is ten and my son is eight. Time flies! Glad you're back, too! Sorry that you've started off the summer in a wheelchair, but sometimes those setbacks are a blessing in disguise, as I'm sure you've learned. Here's to productivity, longevity, learning how to cope, and enjoying the summer, huh? I saw your name pop up in my comments and I got a little thrill :) I had a feeling it was you!! I never took your blog out of my Google reader, I just couldn't handle the fact that you might never blog again. I'm so glad you blogged and let me know how you've been. (Because I am the reason you blog right? LOL)A twisted knee and a hurt arm – that's one for the books. You sound like you had a good attitude and taught yourself some new tricks. Nice to see you back. I can't wait to read what you've written! Oh my goodness!! Take care! I am thrilled you are back … even though I have been on an extended bloggy break myself :) ! !And what a whole lot of firsts you have had. I certainly hope life is treating you better, though your attitude is amazing!